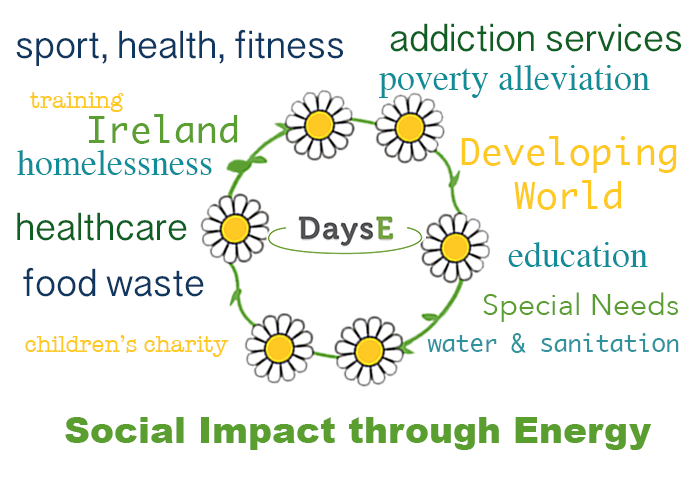 Donate As You Save Energy (DaysE) facilitates social impact through energy. We use an innovative fund-raising model to transfer energy savings as a means of funding energy projects in non-profit organisations. Both the non-profit beneficiary and the donor benefit from reduced energy bills. In the developing world (starting with a pilot in Tanzania ) we are supporting off grid energy projects, bringing energy where it was not previously accessible or reliable. Collaboration is central to our model of social impact through energy. Commercial energy users may be wasting energy needlessly while others can’t afford or access it. We support large energy users in making savings through energy upgrades. Through collaboration with DaysE, they donate the value of their ‘energy waste’ towards energy efficiency measures in non profit organisations. Through the DaysE model, the donation is spent on energy efficiencies, reducing energy bills from then on. In Ireland and with the collaboration of a Utility Supplier, donations can take the form of energy credits at no cost to the donor. Alternatively, donations can take the form of services, supplies and financial contributions based on savings made. This is a donation which keeps on giving unlike most ‘regular’ donations which are spent and gone. In many situations, predominantly in the developing world, communities do not have access to energy. Therefore, DaysE is developing a model to support donors in choosing innovative energy projects. We currently have a pilot in development in northern Tanzania in collaboration with local partners. We are supporting the off-grid energy project needed to bring clean water to Moita, a village experiencing drought due to climate change. DAYSE was launched on the the 21st of December 2014, the winter Solstice; the shortest day of the year in the northern hemisphere. Traditionally it is associated with new beginnings and the end of the darkest days bringing a new era of light and hope. Less than 2 years on from our launch, we were delighted when the DaysE model won the 2016 SEAI Sustainable Energy Awards for Innovation and Community. To that date we had worked with 11 beneficiaries on measures from insulation to Solar PV: Tangible social impact through energy. DaysE is a social enterprise* set up as a not for profit company limited by guarantee. DaysE Directors are Colm Byrne and Mark Dwan. Between them they have 40 years experience in the Irish and international energy sector. They are supported by voluntary members: Vincent Carragher, Micheál Galvin, Laura Glynn, Paddy Phelan. We are on the journey to becoming compliant with The Governance Code – a Code of Practice for Good Governance of Community, Voluntary, and Charitable Organisations in Ireland. *Social Enterprises are business models set up to tackle social, economic or environmental issues. While they are driven primarily by social and/or environmental motives, they engage in trading or commercial activities to pursue these objectives and produce social and community gain.